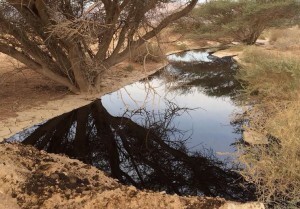 Israel may owe Iran $100 m.
Israel may owe Iran $100 million over the Eilat-Ashkelon pipeline, which made headlines last week when a breach spilled millions of liters of oil into the Arava. The pipeline was a joint project of Iran and Israel in 1968, but the Islamic Revolution of 1978-1979 crushed the alliance and cooperation. The arbitration process dates back to 1994 when the National Iranian Oil Company appointed an arbitrator per the 1968 contractual agreement between NIOC and Israel, asking Israel to do the same. In mid-2013, the Swiss arbiter in the ruling handed down a decision in favor of Iran and against Israel to the tune of $100m. Though the ruling was analyzed in November 2013 by lawyer Yoav Harris in the commercial business publication Hamit’an, it received scant attention until the recent ecological disaster. Israel hatched the plan of building a pipeline in 1950 as a means of getting oil in a politically difficult time, according to Uri Bialer’s thorough examination of declassified documents, in a 2007 volume of Israel Studies. Following the Sinai Campaign in 1956, Israel reached out to Iran, then ruled by Shah Reza Pahlavi. It took over a decade to work out the details, many of them in secret, and the plan almost died several times along the way, but was revived following the Six Day War in 1967. Israel’s plan for the pipeline became public in October 1967, but details were hushed up within two days. The final agreement was signed in Iran on February 29, 1968, and included an operation contract that was set to expire in 49 years – 2017. The pipe-laying began in 1968, and the line was operational from 1969, when Iranian oil began to flow. The partnership collapsed when the Shah fled Iran when the Islamic Revolution got under way in late 1978, and for more than a quarter-century Iran did not pursue legal action on how to claim its assets. Harris commented that Iran took the arbitration path because, among other reasons, if it directly sued Israel, it would be recognizing the state to some degree, whereas arbitration allows it to somewhat avoid that issue. The arbitration proceeding went forward in France and then eventually in Switzerland, with Israel failing at several appeals attempts in the Swiss courts to stop the arbitration. The appeals were exhausted in 2012, and the initial ruling against Israel was handed down in mid-2013. Harris said that Israel can still dispute the ruling on a range of grounds. First, if Israel shows up in court, it can try to present the merits of its defense, since it has not done so until now. Those arguments are numerous and significant, ranging from civil arguments, such as that Iran was the party that broke the agreement and cut ties with the pipeline and with Israel, to criminal, accusing Iran of trying to destroy Israel through a range of terrorist schemes in multiple countries. Why should Israel pay funds to a regime that may turn the funds around to Hamas, Hezbollah or its nuclear program to use against Israel, Harris said the state can ask. Israel can even object that paying Iran could violate domestic law and international sanctions. Even if a final judgment is handed down against Israel, it is very unclear whether Switzerland or other European nations’ executives would actually try to seize Israeli assets in order to enforce it. Asked how the arbitrators could even consider ruling for Iran, Harris said, somewhat critically, that such is the unique position of some jurists, who can focus solely on contractual documents in front of them while ignoring the broader context. The Justice Ministry had not responded by press time, and the Foreign Ministry referred to the Prime Minister’s Office, which declined to comment.